For those in search of a triumphant colonial past populated with eccentric pioneers, the historic Tinnenburra property located in south-west Queensland is rich pickings. It is synonymous with all that is ‘big’ about Queensland’s history, the expectations held in Queensland’s vast west and the people who set about transforming it. Before closer settlement began in the 1880s, Tinnenburra was one the largest pastoral properties in Australia boasting the biggest shearing shed in the world. The property’s legendary owner, James Tyson, enhanced its grandeur. At a time when English capital and colonial banks financed European expansion into Queensland’s semi-arid west, Tyson was an Australian born, self-made ‘millionaire’ who owned a string of properties around Australia. His fame as a pastoral tycoon, however, was only equal to the myth itself, immortalised in the Banjo Paterson Poem T.Y.S.O.N. An intensely shy man, he never married, neither drank nor smoked and insisted that his tea always be brewed in a humble billy can. The Tyson myth is captivating, however, it overshadows a more resonant story about the way landscapes are given meaning and culturally remembered. 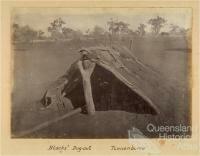 The history of Tinnenburra can be interpreted from multiple angles. Here, it will be approached from at least two, firstly as a place within the framework of pastoral history and secondly from the intimate level of Indigenous people in the landscape with their own parallel connections to place. 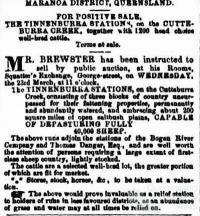 Tyson began applying for leases along the Warrego River and Cuttaburra Creek from 1868. In addition to runs in Queensland, Tyson acquired adjoining runs in New South Wales, part of another large holding, Mooroonowa. Though under separate state jurisdiction, this effectively functioned as a part of Tinnenburra. Combined at their largest extent they covered over two and a half million acres, roughly a third of Belgium. 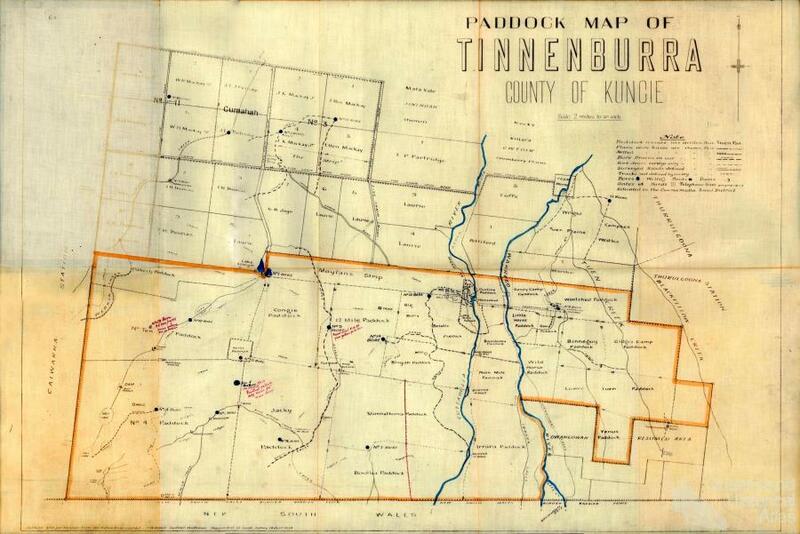 Tinnenburra initially began as a cattle-breeding station as part of Tyson’s network of ‘vertically’ integrated properties. However, with improving wool prices in the 1890s the property began running sheep.To shear the immense flock run on Tinnenburra Tyson built his iconic shearing shed valued at the cost of £7000. According to various accounts it had between 100-120 stands and stood upon 1000 cypress pine logs. Accompanying this monument was the inevitable humour associated with the Tyson mythology. One yarn went that a shearer was fired for swearing and cutting the rams. He slowly walked out of the shed to the other end where the foreman re-hired him not realising the shearer had grown a beard in the meantime. 'This', said Mr Tyson, producing a quart wine bottle of sparkling water 'is a sample from the ninth bore just put down on my Tinnenburra run which was previously destitute of surface water. It is beautifully soft water, and the bore yields between three and four millions of gallons a day'. 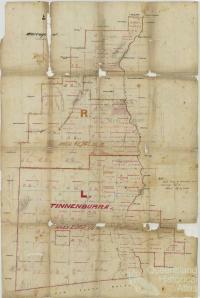 Following Tyson’s death in 1898, the leasing rights to Tinnenburra were held by Queensland Trustees Limited until matters of Tyson's inheritance were finalised. 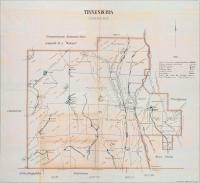 In 1906, 515.6 square miles was resumed resulting in the loss of one of Tyson's bores. 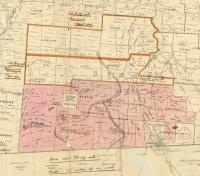 Within this area four blocks ranging between 14,000 to 30,000 acres were reserved for would-be British immigrants. In 1907, Queensland Trustees appealed against the land court's decision to raise the cost of the lease. They did not stay long, however, instead selling Tinnenburra to the Mackay brothers, John Kenneth Mackay and the younger brother, William Hooke Mackay. In 1914, 395.87 square miles was resumed and, following further disagreement over the cost of the lease, the Mackays sold Tinnenburra in 1922, including all stock and improvements, to Edward Montgomery Perrott for £75,000. 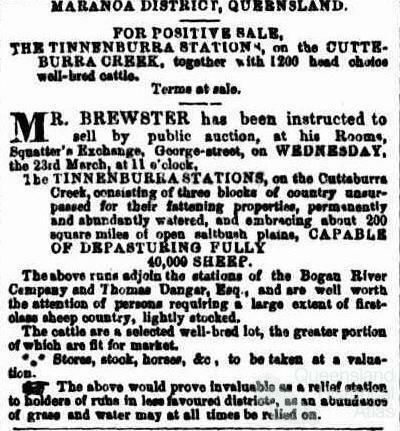 At the time Tinnenburra supported 33,360 sheep, 4800 cattle and 200 horses as well as £26,880 worth of improvements. Perrott, however, had little interest in retaining the property and sold it to the Australian Mercantile Land and Finance Company (AML&F) on a 'walk in walk out basis'. 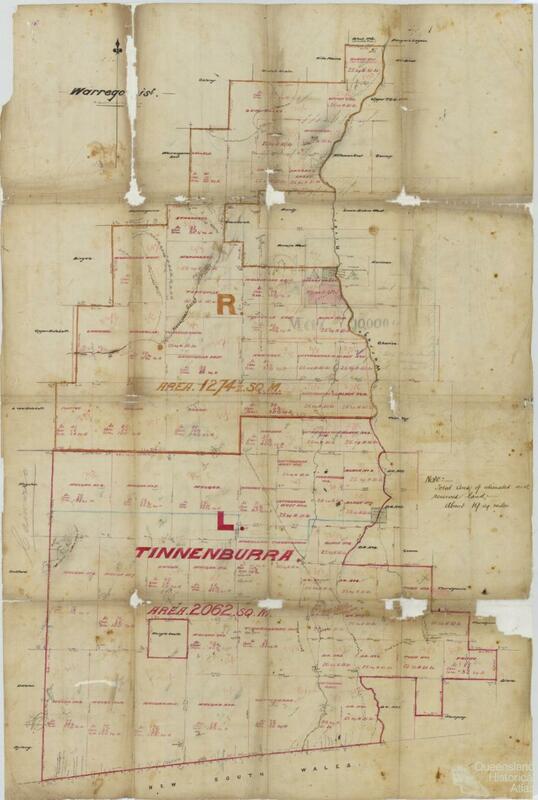 Like Tyson and the previous owners, AML&F represented the ‘big end’ of town and ran Tinnenburra until it was finally broken-up for closer settlement in the early 1950s. 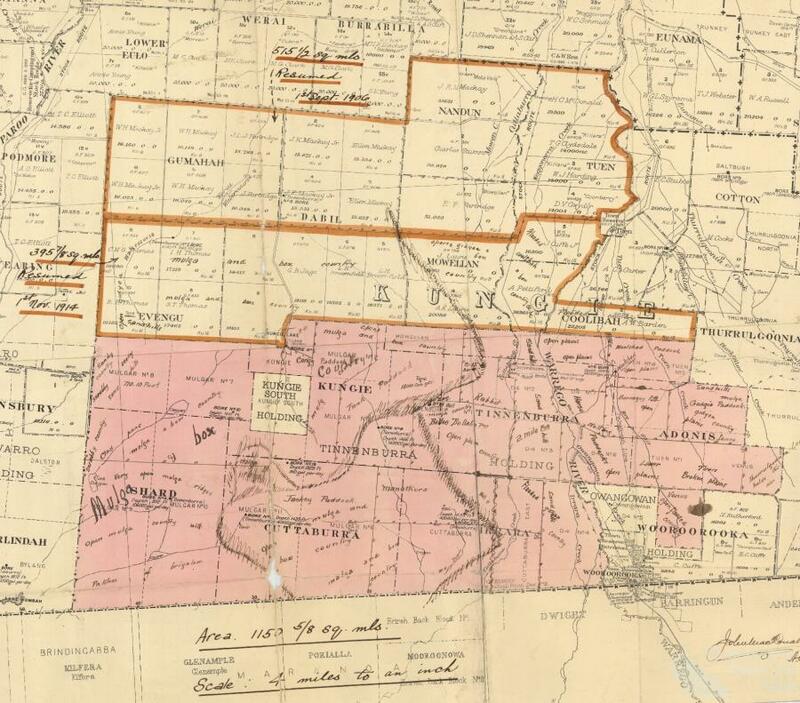 This was the culmination of land policies initiated in the previous century, in particular the 1884 Closer Settlement Act, and marked what seemed to be the end for large company leases in many parts of western Queensland. Since Tyson began his operations, against the backdrop of pastoral development Aboriginal people maintained both physical and cultural connections with the landscape in conjunction with European pastoral activities. The ‘Kunja’ tribe occupied roughly the same area as Tinnenburra in which competition over resources disrupted the hunter gatherer economy. 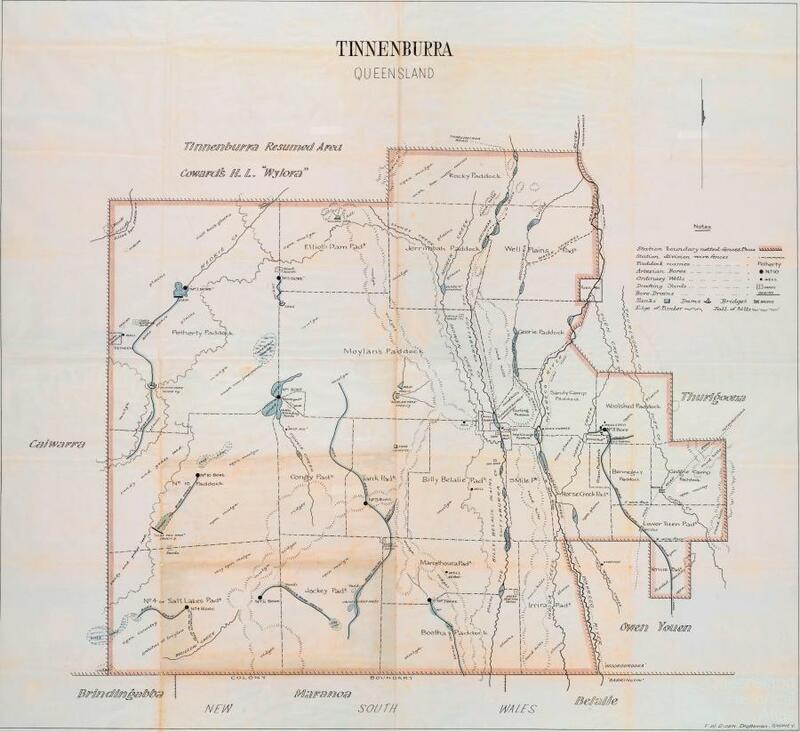 Tribal boundaries were not so much permanent fixtures but fluid and accommodating to the movement of people accessing resources or performing ceremony. Echoing pre-colonial patterns of economic and social migration, Tinnenburra subsequently became a new node of activity attracting neighbouring Aboriginal groups, settling and intermarrying with local people. According to Aboriginal oral tradition, Tyson was reportedly sympathetic to the Kunja and reserved three square miles for their exclusive use, insisting that no drays enter and their culture not be interfered with. This area was located on a large sand hill on the eastern bank of the Cuttaburra and continued to be a major focus of Aboriginal cultural life. While there is no written record to verify Tyson’s ‘generous’ offer, the story is in keeping with his traditional paternalism towards Aboriginal people. 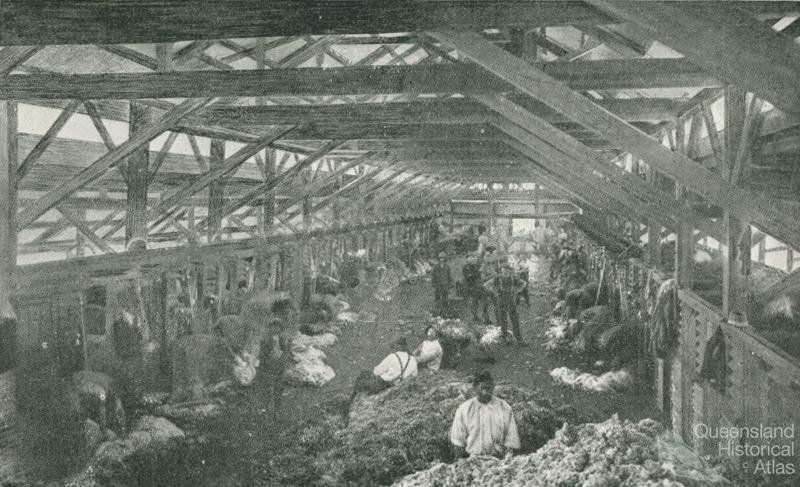 Such an arrangement also had economic benefits providing a convenient source of cheap, though often skilled, labour. The interaction between Europeans and Aboriginal people meant Tinnenburra became ‘culturally hybridised’ supporting both European and Indigenous activities as well as meanings attached to the landscape. Water holes formed the initial points of cultural intersection. 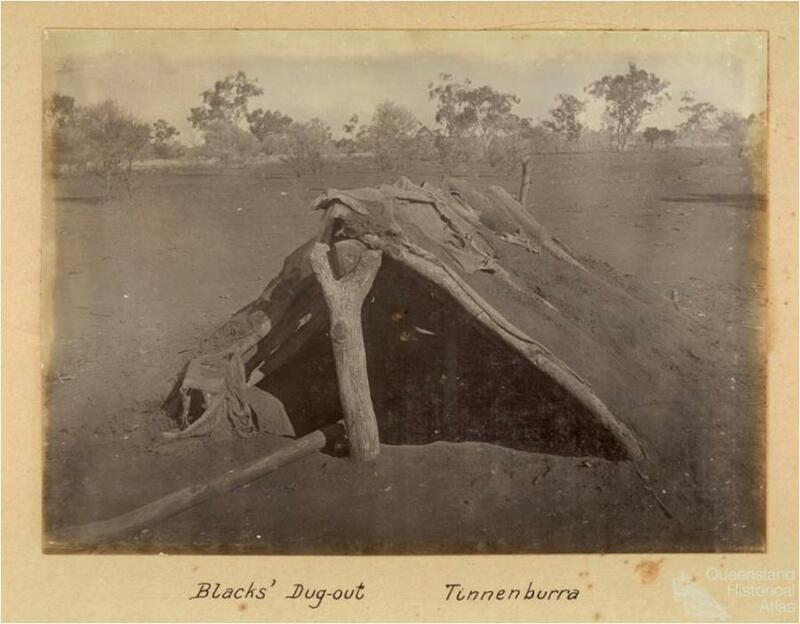 ‘Dinnenbooroo’ was an Aboriginal ‘meeting place’ on the Cuttaburra where the homestead was built and from where the anglicised ‘Tinnenburra’ has its origins. Downstream were other large waterholes where Aboriginal people congregated and continued to perform ceremonies well into the 1920s. Bootha Waterhole was a place strictly for women to perform dances and give birth while Binya Waterhole was the place for rainmaking ceremonies. Illustrative of the spiritual-physical links across the property, rainmaking required special stones collected from ‘Rain Stone Mountain’ near Tinnenburra’s western boundary. These were brought back to Binya by the old men, part of a ceremony that would appear to represent unification of two animated places, symbolising land and water. Senior Aboriginal men performed multiple roles as stockmen, figures of authority and 'clever men' capable of performing magic and ceremonies. Jimmy Nyngan, the so-called 'King of the Cuttaburra', is credited to have performed the last initiation ceremonies for boys. Charlie Maranoa was another senior figure. The journalist and author A.E. Yarra (1885-1970) spent some time working on Tinnenburra when it was owned by the Mackays. According to an article which appeared in the Courier Mail in 1934, Maranoa was the official 'king' of the blacks and a 'wise man of about sixty' who scoffed at the white man's lack of 'bush education'. 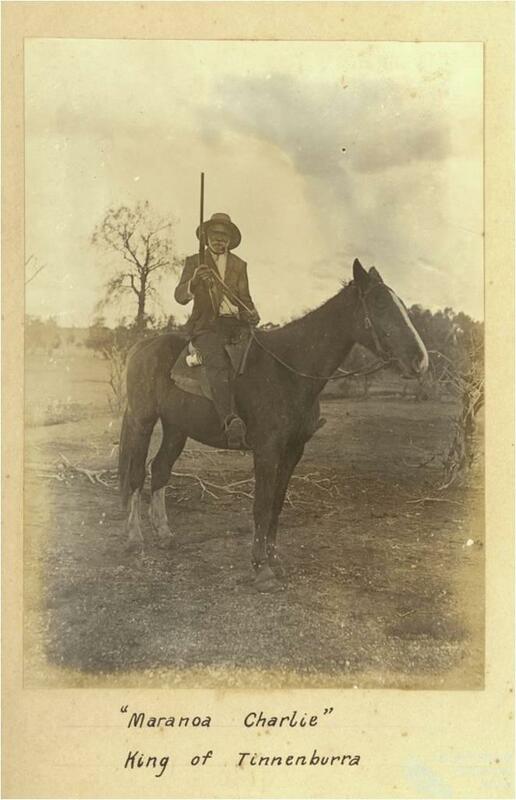 A photo of Maranoa around 1910 shows him seated on a horse while holding a rifle and clenching a pipe between his teeth. He must have been an impressive character too, as Yarra would later write a short story and mystery-romance novel, The vanishing horsemen (1928), in which the unlikely Kunja elder featured. 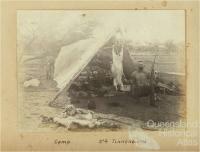 Following economic Depression in the 1930s and eventual final sub-division, Aboriginal people were gradually forced off Tinnenburra and many moved into the fringe camps in nearby Cunnamulla. Many years after leaving the camp ‘Granny’ Mackellar one of the oldest surviving members of the Kunja would often say in her native tongue 'Matya ngaya bindala Dinnenbooroo' translated as 'I used to live at Tinnenburra a long time ago'. She died in 1971 at an estimated age of 101 and was one of the last native speakers of the Kunja dialect. Evidence of the Tinnenburra camp remains in the form of discarded tobacco tins, wagon wheels and the remains of humpies. With the exception of a few graves, there is no outwardly significant reminder of the lives of the people who lived there. In 1977 an unsuccessful attempt was made by descendants of the Kunja to have the graves recognised as an Aboriginal ‘Sacred Site’. Later, though, it was included on the Register of the National Estate and the Heritage Commission funded the erection of three plaques. Commemorating the last Aboriginal people to be buried on Tinnenburra they illustrate how places may be resurrected from the past and where, depending on the viewer, the mundane may in fact be deeply profound. By men that Tyson knew! That meed of sterling worth.